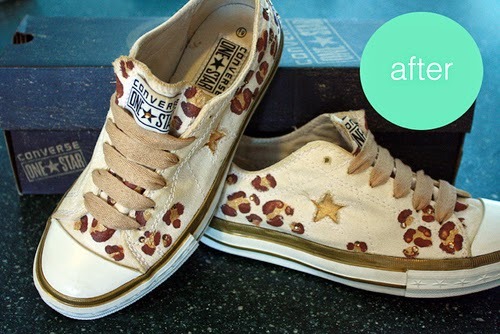 Shoe makeovers are something that I absolutely love. In fact, I've done over 60 myself! 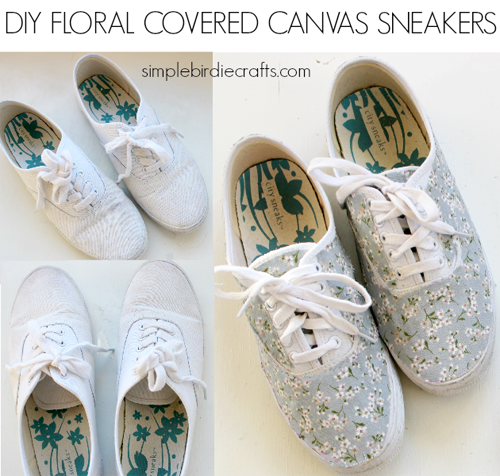 Shoes can be a great and inexpensive canvas and a way to walk around in some art! 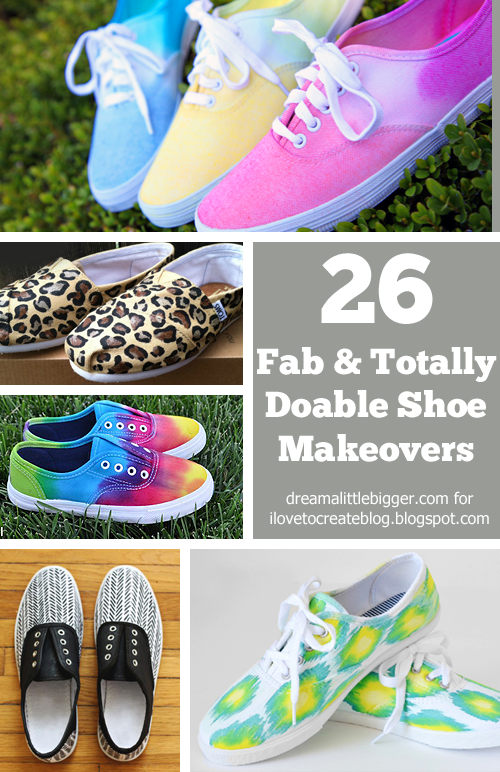 Check out these 26 fab shoe makeovers that you can totally do your self. Yep, totally doable. So bust out your tie dye, fabric paints and fabric markers, grab a pair of sneakers (or two) and let's do this thing. Check out these amazing floral sneakers by Cathy from Trinkets in Bloom here at iLTC! I love the high impact the colors make. What a statement. Even if you're not much of an artist, these simple shapes are totally doable! 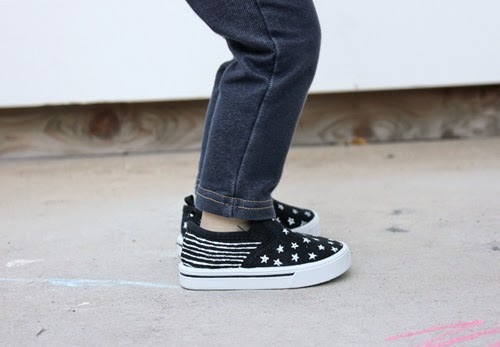 Kids deserve awesome DIY sneakers, too! These fab black and white cuties from Delia Creates are super simple to create yourself. Plus the black and white is super high impact and has quite a bit of pop! 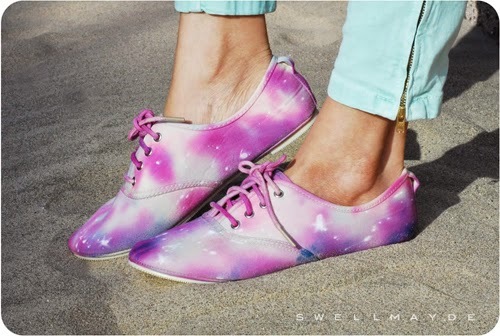 If you've never seen these amazing galaxy sneakers from Swellmayde you must be living under a rock. These were the very first pair of galaxy anythings that I thought were awesome. As I watched many, many tutorials (including one of my own) come out these shoes always remained the best galaxy shoes I'd ever seen! 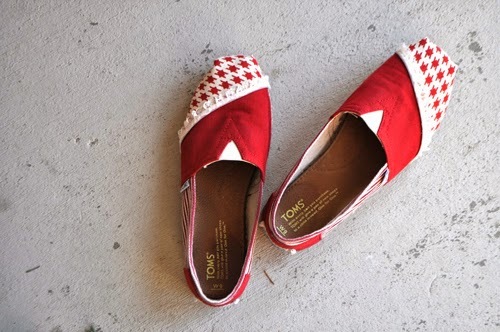 Toms are just about the comfiest shoes on the planet and I love the altruism behind the brand. BUT when you wear a pair out you may not want to run out and buy a new pair right away. Luckily Cheri Heaton's got you covered and will show you how to get a bit more life out of those kicks you may have worn a toe hole into! You know what's awesome? Converse? You know what makes a pair of these sweet, sweet kicks even more awesome? Leopard print. Check out this fabulous yet understated sprinkling of leopard spots project by A Pretty Penny. Now I've got to say that chevron just ain't my thang, but a shoe makeover this great has to be shared. These black and white cuties from Honeybee Vintage are cheap and easy to do with a great little way to make your chevron stripes. Now I have to admit I think these shoes are absolutely fabulous simply because I made them! 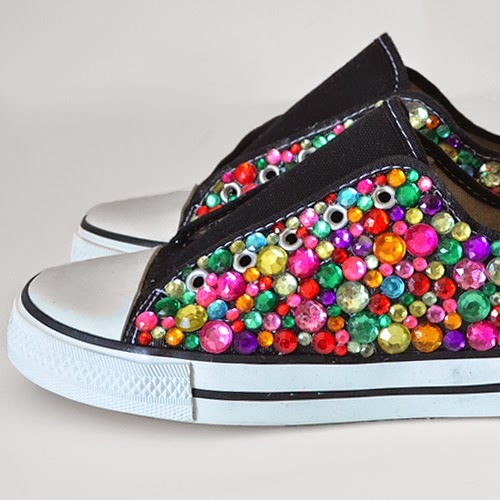 But if you like bling grab the Tacky Glue because these rhinestone covered chucks style kicks will have you stepping out in style! 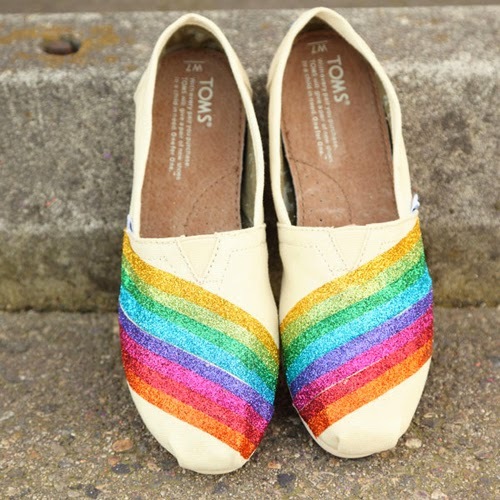 Looking for some simple, understated, yet distinctly DIY and custom shoes? The Merrythought has just the ticket. A pair of clean white lace ups meets some gold puffy paint and the end result is just magical. Just look at the pep in her step! Ombre is just so very and it doesn't seem to be going anywhere. Which is awesome because I love it! 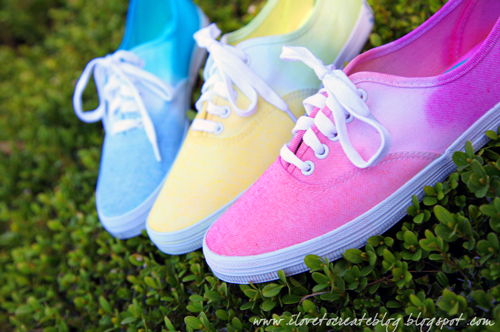 Which is why I think these DIY ombre sneakers are super fab. 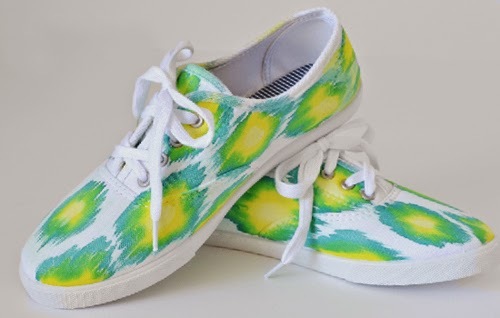 Grab some cheap tennies and a package of tie dye and you can have a whole set of shoes to perfectly adorn your outfits during this deliciously warm weather! Sure cap toe shoe makeovers are all over the place, but have you seen on that is A. neon and B. covering both the canvas toe and the rubber sole around the toe? Genius and awesome and a totally unique shoe makeover from Yesterday on Tuesday. Lots and lots of shoe makeovers are just so bright and colorful and that's totally not for everyone. 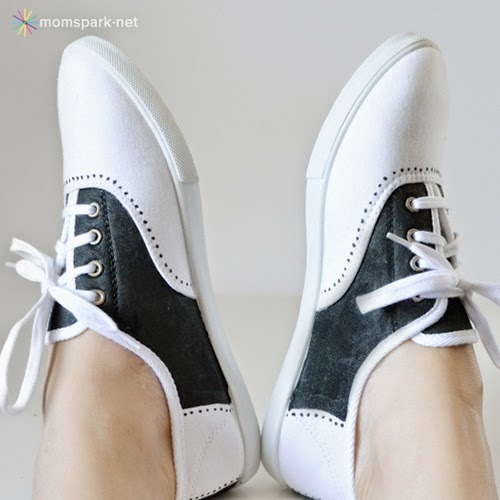 So why not grab some fabric paint and a fabric market in black and mimic these fantastic DIY sneakers from A Beautiful Mess? I love ikat so much that for my very first iLTC blog post as a contributor, I made a pair with some left over tie dye. So when you've got some dregs left after dyeing up your summer tees, bust out the sneakers to put your leftovers to good use! Are you keen on thrifting? Have you found shoes that perfectly fit your feet but aren't exactly the cutest things ever? Simple Birdie Crafts will show you how to get some super results using some super fabric glue and prettily perfect floral fabric! I super love bicycles and I super love denim and chambray sneakers. Pair the two together and you've caught my heart for what may be the cutest shoes ever. Sure these were made by Our Fifth House for a little girl but these are easily great for an adult such as myself! There will always be a need for black and white shoes in just about every wardrobe. Oh, and polka dots, too. Every closet needs a smattering of polka dots. Getting these cute little orbs into your wardrobe doesn't have to be pricey or difficult as What I Wore will show you. There aren't a whole lot of boys out there (or even 40 year old men, for that matter) who don't LOVE Star Wars. And I'd venture to guess that they'd love having their own R2D2. 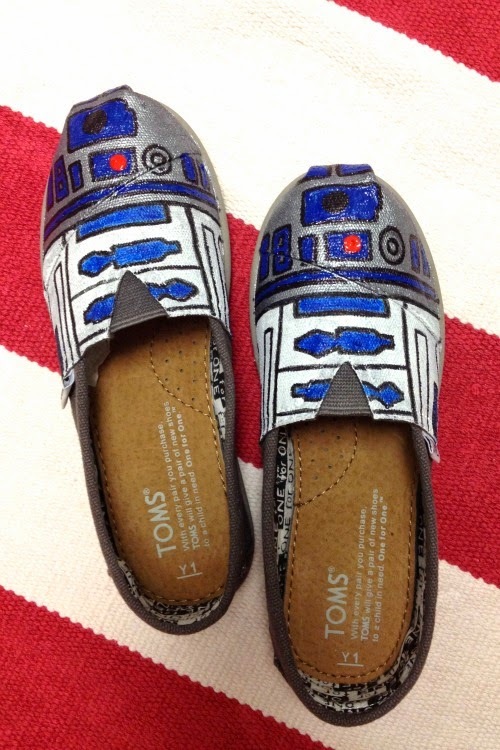 But since that won't be happening, you can make them some awesome R2D2 Toms instead with this tute from Cheri Heaton! I must confess this is another pair of my very own sneakers and though I made them specifically for kicking around way too many neighborhoods on Halloween I still wear them. All of the time. 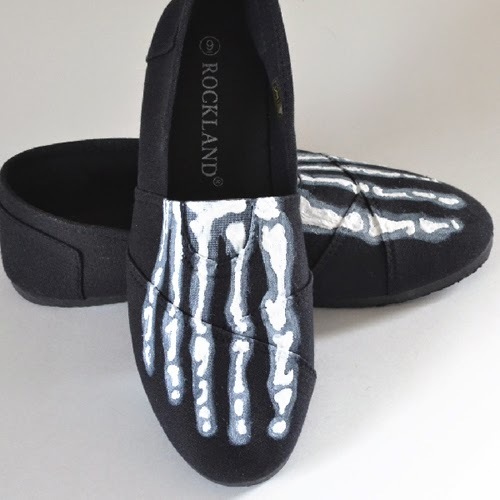 Because skeleton shoes are awesome. Dimensional skeleton shoes (Puffy Paint, baby!) are even more awesome if that's even possible. Have glitter shoes been done to death? Maybe but I really don't care. Glitter is awesome. Glitter on your feet is just asking for everybody to take notice of your sparkling personality and awesome taste in craft supplies as Poppytalk will show you. I must admit that when it starts getting warm I start jonesing for my tie dye kits. And who says you can only tie dye tee shirts? Somebody who doesn't realize that tie dye makes everything awesome. Especially shoes which My Frugal Adventures obviously already knows! 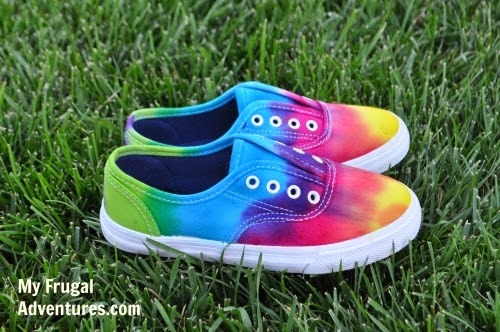 Tutorial: DIY Tie Dye Children's Shoes <-- but adults can totally rock these! The way little kids like to zoom from here to there, they totally need some wings on their shoes. And, dude, what kid wouldn't flip out for some wings on their shoes? The very talented shoe makeoverist Cheri Heaton will show you how to make your own. Bonus points for being super quick and super easy! I absolutely love having a pair or two of shoes that make people go - hey, those are different and I like 'em! And what's more unique than a pair of sneakers adorned with whales and rickrack? I'm totally loving these shoes by Jennifer Perkins and have my eyes peeled some striped cuties just waiting for a little paint for myself! What little girl doesn't love pastels? Well, some don't but for the ones that do I'm thinking they'd LOVE a pair of these cloud and shooting star sweeties from Magic Pearl Heart. I especially love the alternating colors on the shoes for each side. Super cute! So we've already discussed that glitter on shoes is awesome. Add a rainbow of colors and the fact that you don't even need to open a single jar of the messy stuff and you're ready for some sweet and colorful kicks in a hurry! 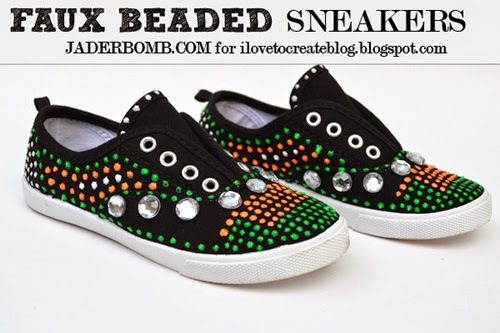 Looking to add a little bit of bling and some hot dots to your shoes? 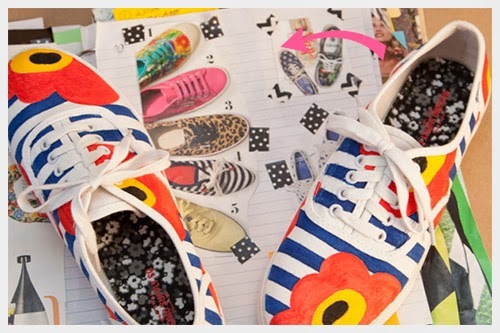 These fancy and super artsy kicks from Jaderbomb are just what you need! 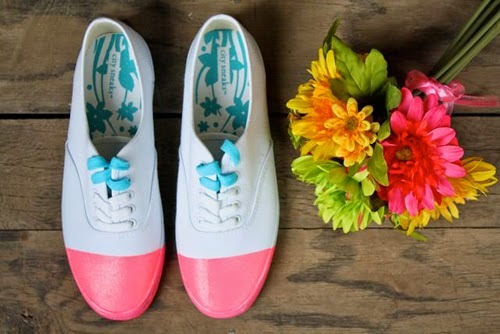 So bust out the Puffy Paint and get ready to dot up some shoes! And last, but certainly not least we've got some more leopard spots from the very talented Pearmama because leopard print is always fun and always hot! 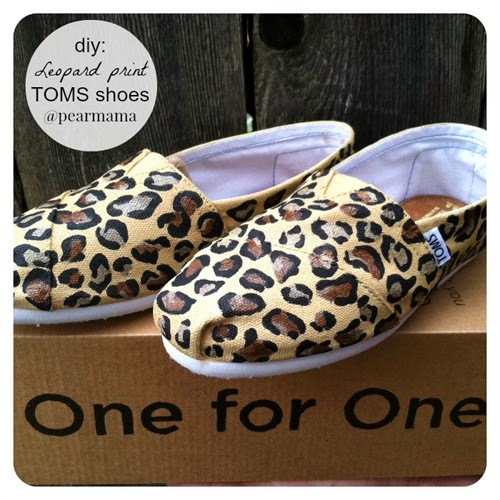 Watch how she takes a pair of plain white Toms and rocks them out safari style! Well, that's it for today! 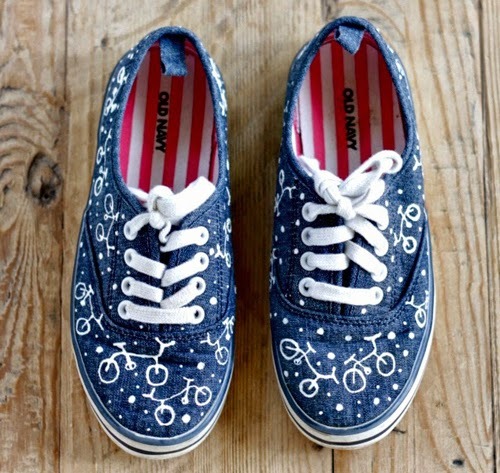 Which pair of these 26 DIY shoes are your favorite? Tell me, I am desperate to know! Oh, and visit me at Dream a Little Bigger some time :) and be sure to tune back in tomorrow for another shoe makeover that I'll be sharing here! Wow, such a beautiful sneakers. i love it. I bought also sneakers shoes for women from online shop.